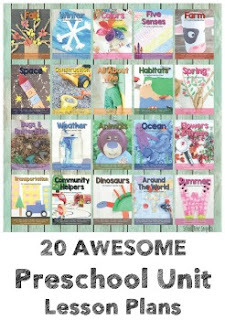 We shared our Textured Bear Craft for the book, Corduroy, a few days ago. Today I am sharing a bit more about how the rest of our Corduroy Inspired Preschool week went; there were plenty of activities to keep Little Sis and Baby Brother occupied! Most were set up with Little Sis in mind, but Baby Brother enjoyed playing with the teddy bear counters and digging through a box of buttons for one of the printable activities! Button counting -- Instead of adding buttons to the bears to practice counting, we played a game of hide and seek; Little Sis and I took turns hiding a button underneath one of the bears and we had to guess which bear the button was under. That was a bit more interactive for her! Teddy Bear Number Game -- We took turn rolling the die and adding that many teddy bear counters to our bear. First one to 10 won! 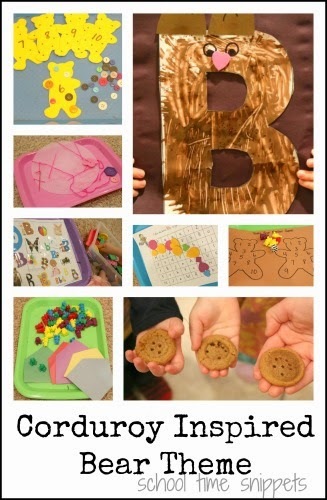 B is for Bear Craft -- using a large letter b template, I had Little Sis paint the bear brown using a fork! Once it dried, we added some ears, eyes, and a pink nose. Oh how I miss doing Letter of the Week crafts!! I think we will start adding them in being that she loves to craft! Textured Bear Craft inspired by Corduroy's name!